And now that you’ve opened that floodgate of awesome, you can catch the rest over here on YouTube. 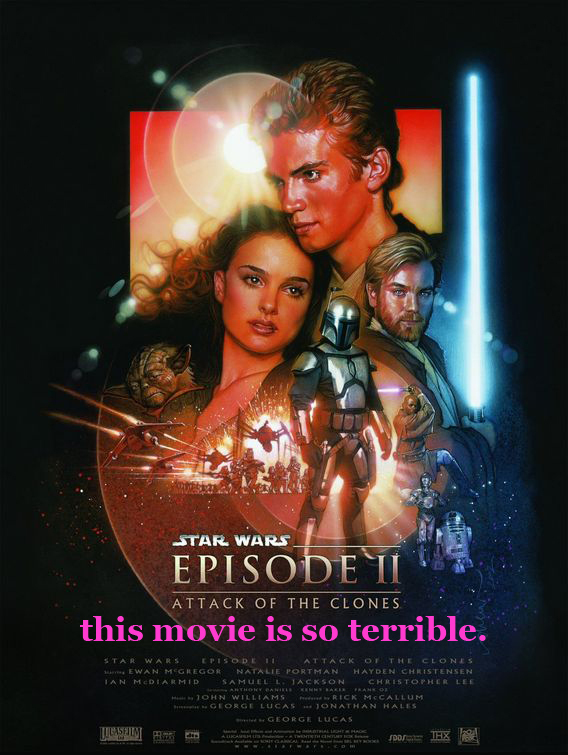 Sure, I guess it’s a little bit bah-humbug to watch someone make an irrefutable case for Attack of the Clones being the soulless, bottom-line driven afterbirth that crawled forth from The Phantom Menace‘s bad-idea baby cavern, but then you remember you wouldn’t have this gem of a review without it, and that almost justifies Episode II‘s existence. In other words, this is the greatest Star Wars Day miracle of all. This entry was posted on Tuesday, May 4th, 2010 at 4:06 pm and is filed under Movies, Reviews and Video. Tagged: Attack of the Clones, Bad Ideas, Ewan McGregor, George Lucas, Hayden Christensen, Homo Thigs, Natalie Portman, Nerd Things, Red Letter Media, Samuel L. Jackson, Star Wars, Star Wars Day. You can feed this entry. You can leave a response, or trackback from your own site. And how could you forget that I had to explain to you as a 5 year old after a Star Wars extravaganza on TV that you would have to wait till the summer for the next episode, rather than it being on TV the next night.